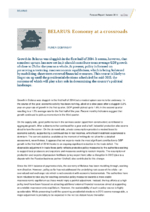 Growth in Belarus was sluggish in the first half of 2014. It seems, however, that a modest upturn has now set in; it should contribute to an average GDP growth of close to 2% for the year as a whole. At present, policy is focused on preserving a teetering macroeconomic equilibrium, which is being bolstered by mobilising short-term external financial resources. This course is likely to linger on up until the presidential elections scheduled for mid-2015, the outcome of which will play a key role in determining the country’s political landscape.